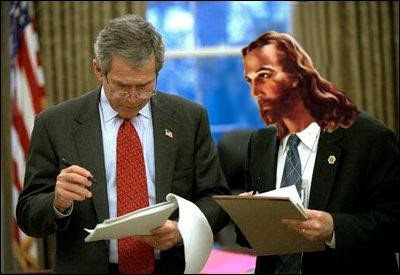 –How did Jesus become pro-war, pro-American and pro-rich? “The Jesus of the Gospels ministered to the poor and to the outcasts, had no property or possessions, and famously told a wealthy young man that it was easier for a camel to pass through the eye of a needle, than for a rich man to enter the kingdom of heaven,” the popular writer told members of the Interfaith Communities United for Justice and Peace July 7 at Immanuel Presbyterian Church in Los Angeles. Curious about this drastic shift, Wakefield began researching the troubling query and was surprised at how far back the religious right’s roots went. The search led him to Senator Barry Goldwater’s defeat for the presidency in 1964. Realizing they needed a wider base, he said Republican strategists saw that fundamentalists and evangelicals were a “virgin timber” voting block. And soon a partnership was forged. “The religious right started with the Republican right,” Wakefield reported, adding that along with this partnership, religious conservatives also forged a media empire, which today adds up to some 1,600 TV stations. Just one, “Focus on the Family,” has 200 million watchers in 99 countries. An official from the Christian Coalition told him that they were only intolerant of sinners, said Wakefield. But the author observed that it seemed a “very odd creed” for the group to call itself Christian, when it was Jesus who told a crowd that he who was without sin should cast the first stone. He also talked about the divisiveness of the movement, whose faithful often attempt — and succeed — at driving deeper religious and political wedges between themselves and mainline Protestant congregations.